In a worldwide focus on the theme of participation, the Goethe-Institut looks at topics ranging from questions around ownership of the public space to emancipatory movements and regulation of our communication. For the Goethe-Institut in Sub-Saharan Africa, supporting cultural projects that work with LGBTI (Lesbian/Gay/Bisexual/Transgender/Intersex) and Queer representation is particularly significant, given the ongoing prosecution of this group within many countries in the region. to be published on, and made widely available via Wikipedia. Traces of Ecstasy is both a sobering reminder of socio-political inertia and what Fani-Kayode intended it to be: “an imaginative investigation of Blackness, maleness and sexuality”. Women were practically invisible in the African art scene for a very long time; work in the arts was even considered unseemly for women. But gradually a forum is growing for female subjects and forms of expression. "Kenyans are our most important audience"
The film Stories of our Lives by The NEST Collective portraits five authentic stories of queer life in Kenya. Where is the voice of African women in the arts today? 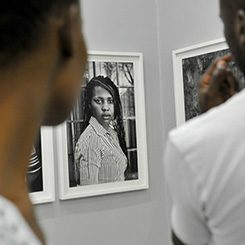 The Goethe-Institut invited 24 women from across Africa, practising in the arts field, to discuss issues of positioning, gender and identity at the ArtsWork workshop in Johannesburg. Men and women are equal. It says so in the German constitution. How is this reflected in professional reality in Germany? The feminist choreographer and dancer, whose activism is embedded in her art, tells Stefanie Jason that the fight for gender equality is not over.